The action is inspired by the fantastic Oud players in the Arab world and particularly those integrating new scales and techniques of playing, where for some reason, involving such wonderful instruments in contemporary classical music achievement is almost very narrow. On the other hand the Korean school for traditional music and instruments (which will be present in the action as a guest) was very successful in even exporting their own traditional instruments as solo instruments in works of the world most important contemporary composers. 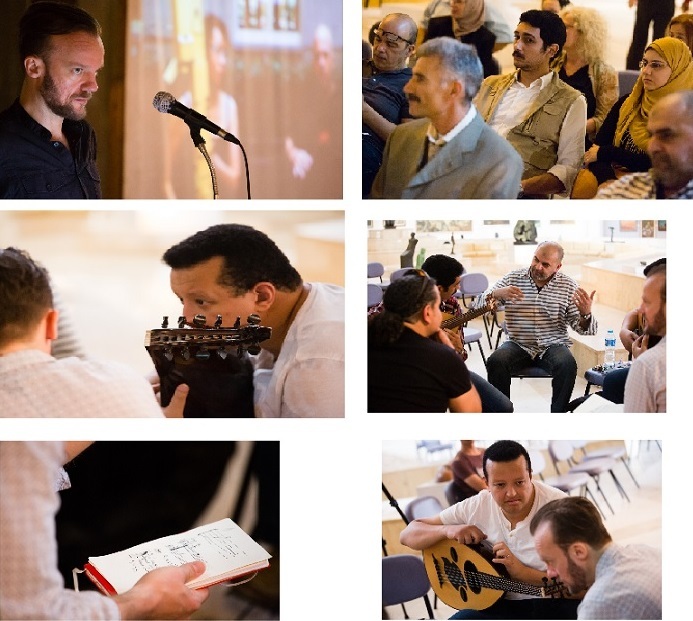 Many questions need to be answered: is it the Music education, the instruments or the artistic ambition of interpreters or generally the nature of Arabic music with its unique theory, that impedes development in this field. Certainly, another very important aspect of the aim of the action through making Arab instruments accessible for composers from all over the world, is the huge cultural outreach, that can follow, as the Japanese and Korean experience showed, that even succeeded in overstepping the cultural borders not only with their traditional music, but also in the fields of religion, philosophy and art. 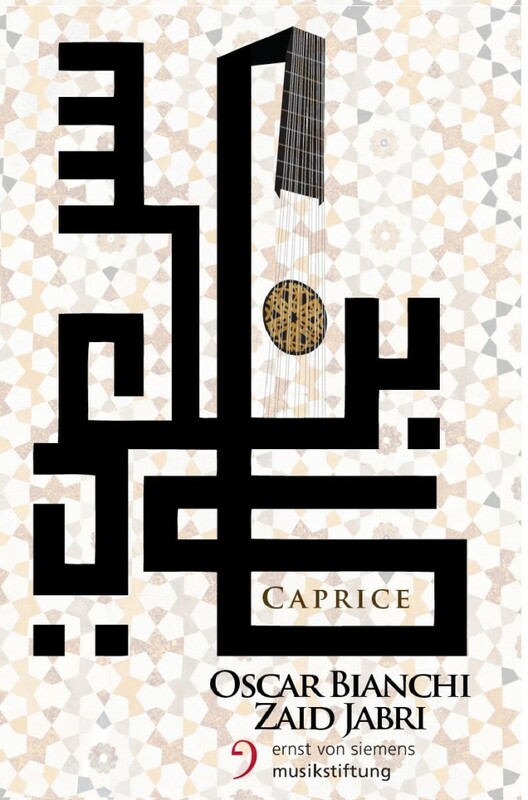 Caprice is an action to foster involving Arab instruments in contemporary compositions through developing an advanced notation in order to enhance the clarity of text transmission and explore the instrument characteristic. In 2015-2016, the „Oud“ is to be Instrument in focus. The action as well is a complex of other activities on an Artistic, academic and intellectual scale, depends on funding and the different interests of cultural foundations, we will form the further development of the action. Several main Composers will participate, thank Ernst von Siemens Music Foundation whom gave us the First kick to be able to start the interaction and other culture foundations as Pro Helvetia whom heled in inviting Oscar Bianchi to the First interaction.Two Commissions for Zaid Jabri and Oscar Bianchi wehre secured through the E.V. Siemens Music Foundation and a Third commission in planing for Wilbet Bulsink. In November 2015 is the Second Session planed, Zaid Jabri and Wilbert Bulsink are our Guests. Beside the Premier of Mr. Bulsink of Vordat er…. and Other academic activities related, Both invited composers will share there artistic Ideas and Vision of the New Compositions in Two Lectures Open to Public followed by an Oud Recital by a Very Interesting Iraqi Oud Player Youssef Abbas. The Site: Al Manasterly palace is situated in the south western corner at the end of Al Rawda island. It is the remaining part of a development built by Hassan Fouad Al Manasterly Pasha 1851 A.D./267A.H.. His mosque where he is buried is situated near the palace. On the left side stands the Nilometer that dates back to 861A.D./247A.H. in the reign of Caliph Al-Mutawakkil `Ala Allah Al Abbasi, bestowing more beauty and significance on the place. The Palace owner: Hassan Fouad Pasha Al Manasterly. His name is a derivative of the city of Monastir in Macedonia near the Bulgarian borders. Hassan Pasha was Egypt Katakhda in the reign of Abbas Helmi He became Cairo’s governor in 1854 A.D., representative in the Ministry of Interior and then supervisor of the Ministry of Interior. Architectural description: The palace consists of a main rectangular hall 12mx24,40mthat directly opens to the outside through a door in the southeastern wall preceded by a four-step marble case. The terrace covers the northeastern and the southwestern sides. The palace’s present main gate is located in the northwestern side. 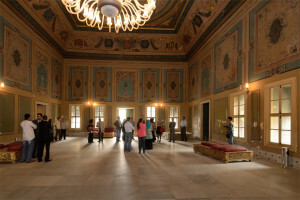 The second hall is located to the west of the main hall. It has been divided into three halls. Northern to this hall lies a rectangular room. Southern to the same hall there is a bathroom and another rectangular room. A terrace overlooking the Nile surrounds the building from the west and intersects in the end with the southwestern terrace. The ceilings: The palace is hailed for its splendid ornamented ceilings of various wooden architecture designs: leveled ceilings, dome or semi-dome ceilings. The ceilings are internally covered with plaster and garnished with colored ornaments. Dried plastic has been used to produce different greenery shapes. The terraces surfaces have been covered in the same way. All ceilings have been isolated to protect them from rain. 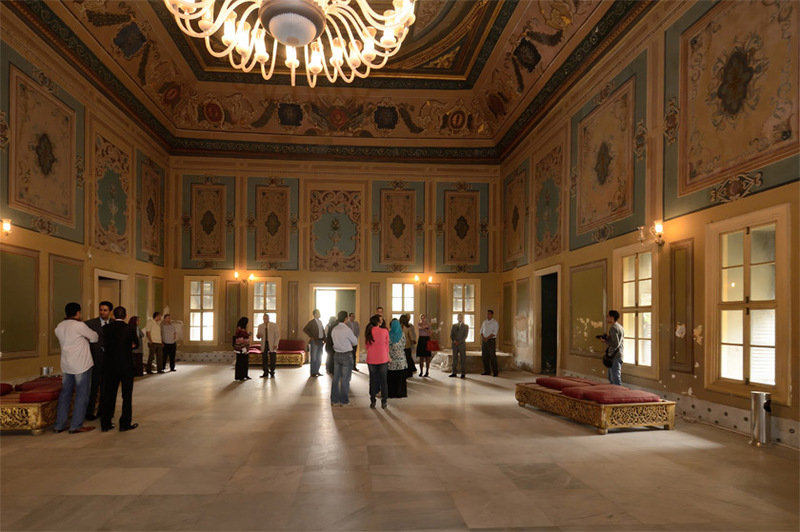 The Palace’s floor: A 35m high quadratic marble has been used for the floor of the two halls, the room southern to the second hall, the terraces and the bathroom. Parquet floor is fitted onto the two rooms lying in the palace’s north-western front. The ornaments: The walls and ceilings of the palace are garnished with colored greenery ornaments and some birds figures. The influence of the Ottoman rococo is quite obtrusive especially in the buildings of that period which is a European impact. Moreover the Pharonic impact is highly discernible in the Corniche at the external fronts of the palace.